a guided workbook to journey through pain into a life filled with hope. A Biblical Model for Hope is a guided workbook. It will help the reader understand why they struggle in life. It will also equip them to move through pain into freedom. Four phases of life’s journey are explained and explored. The phase’s of innocence, sorrow, survival, and liberty reveal the deepest desires of the heart. Living in a fallen world, wrestling with dignity and depravity, and embracing the grace and strength of Christ lead the reader from survival into thriving. This workbook can be used in a group setting or individually. It is appropriate for a Bible study group or in a counseling setting. The author has counseled, taught, and spoken on issues of Christian Counseling for nearly 30 years. He is co-author of “Thriving Despite a Difficult Marriage”, an Amazon bestseller, and “Transformative Change”, published in 2014. 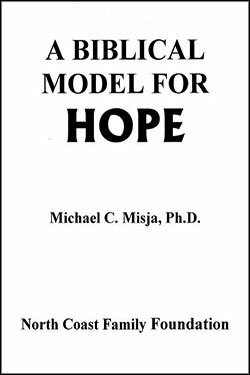 Michael Misja, Ph.D. has counseled, taught, and spoken on issues of Christian Counseling for nearly 30 years. He is co-author of “Thriving Despite a Difficult Marriage”, an Amazon bestseller, and “Transformative Change”, published in 2014. Along with his brother, Chuck, he co-founded North Coast Family Foundation, a Christian Counseling Center in Northeast Ohio.